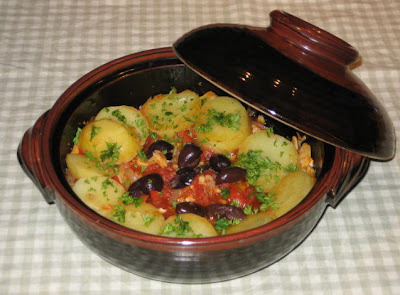 The Food: Salted Cod with Potatoes, Tomatoes and Olives. This is another comfort food. Again, this is not a dish you decide on in the afternoon for that night’s super. Salted cod takes time to soak and remove most of the salt. First day change water every 4 hours or so and next day after 36 hour soak rinse under running water and boil for 20 minutes. Rinse again, then remove all traces of bones and skin. Some bones will be very short. Regardless of how careful I was in removing the bones and then double checking I have always found 1 or 2 on my plate. This is very tasty meal and worth the extra effort. § Preheat oven to 350 °F. § In a 10-inch Dutch oven or stove-top proof ceramic baker, sauté the onion and the garlic in the olive oil until the onion is golden, about 10 minutes. Remove and reserve about half the onion and garlic mixture. 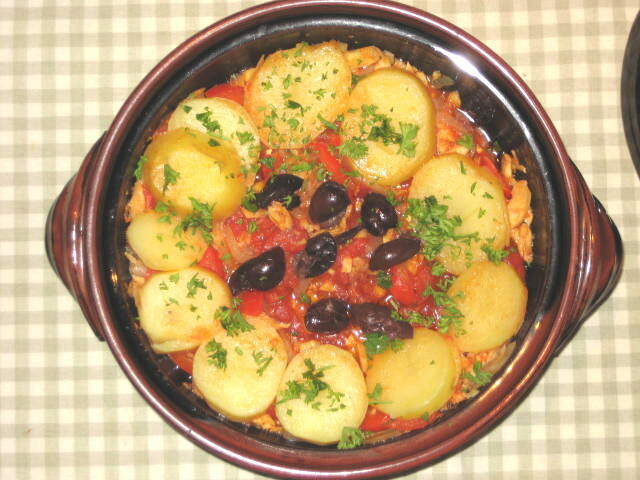 § Place layer of salt cod over the onions remaining in the pan, then arrange sliced potato in a ring with potato slices overlapping. Spread around the reserved onion mixture in centre. Cut or crush the tomatoes directly into the pan and spread them in centre. Spread the olives over tomatoes and pour the wine over all, then drizzle with the additional tablespoon of olive oil. § Cover and bring to a simmer over medium heat, then place on middle rack in oven and bake for 45 minutes. § Let stand, covered, for 10 minutes, during which time the potatoes will become softer, absorbing some of the juices; the juices left in the pan, although reduced in volume, will become a rosy colored sauce. For maximum visual effect, bring the pan to the table undisturbed and serve, hot or warm, directly from the pan. Loosely based on Sicilian classic.